Personality: Dark & evil. Is very cold to all except to his dead wife Bastila Shan. Is a very powerful Strategist & will do anything it takes to win. Description:Using the power of the force the user can summon storm clouds and make natural lightning(natural lightning is stronger then electricity) strike there opponent. Description:The use sends a bolt of electricity out of there hand at there oponent. Description: Uses the dark side of the force to implant horrible visions in the targets heads. This will cause them to drop their guard, leaving them open for an attack. Description:this force repulse is much stronger then the regular one, the user gathers all there force energy, jumps in the air and releases it in a devastating force bomb. It'll destroy everything in its path. Description:The user constricts the opponents windpipes with the force. Description: By the using a form of force Lightning, it sends an electrical overflow of power into a machine, causing it to explode form the power overflow. Revan was said to use this on a whole galactic cruiser once. It is unknown if it has been proven. Description: This is an advance form of the Jedi Mind Trick. It can break through even the toughest of force resistance. Description: This force power is used to levitate people or nearby objects. Description:The user can let out a blast of force energy pushing the opponent away. Revan's family name and birthplace are unknown. As was the Jedi tradition, Revan's Force-sensitivity was discovered at a young age and he was later introduced into the Jedi Order. When Revan was first trained as a Jedi Padawan, both he and his close friend, Malak, were found to be strong in the Force, although Revan was undeniably the stronger of the pair. Initially, Revan's Jedi training was undertaken by Kreia on Coruscant, but, eager to learn more about the Force, Revan and Malak soon visited Jedi Master Zhar Lestin for additional training. Though Zhar noted that Revan had an "insatiable" hunger for knowledge, he dismissed it as exuberance and eagerness, believing the youth would grow to be a future champion of the Jedi Order. Revan eventually left Kreia's tutelage entirely, going on to study beneath numerous Jedi Masters, including Zhar, as well as Masters Dorak and Kae. In addition, rumors perpetuated by Mical later suggest that Revan studied the process of Force bonding during his many apprenticeships. Master Vrook Lamar seemed convinced that Revan sought the forbidden legacy of Sith alchemy and sorcery. Eventually, however, he returned to Kreia, when in her own words, "he realized there was nothing more to be learned from the Jedi - except how one could leave them forever." By 3,956 BBY the general consensus among the Jedi Masters on Dantooine was that although Revan had been a promising Padawan, he had also been headstrong, proud, and too quick to dismiss the dangerous lure of the dark side. Nearly 4,000 years before the events of Star Wars Episode IV: A New Hope, a warrior race known as the Mandalorians began raiding systems in the Outer Rim of the Galaxy. The Jedi Council did not allow the Jedi Knights to participate in the war, even after the attack on the planet Cathar. Despite Revan's and Malak's (now Jedi Knights) beliefs that the Jedi should help the Republic, the Jedi Council insisted on staying out of the war, feeling that the true threat had not yet revealed itself. Many younger Jedi were unwilling to wait as the Mandalorians assaulted planet after planet, and so Revan and Malak organized a force of rebellious Jedi Knights to assist the Republic in defeating the Mandalorians. Many Jedi felt inspired by the charismatic Revan, and so they joined him. The Mandalorians expected Master Kavar (an established general, and one of Revan's teachers) to lead the battle instead of him. Revan proved to be not only one of the more powerful Jedi Knights in the order, but also a master tactician and strategist. He was willing to sacrifice entire planets so as to make the most important ones impenetrable. And despite taking massive casualties (sometimes as many as ten Republic soldiers for every Mandalorian), Revan was consistently able to outmaneuver and overwhelm the enemy both in space and on the ground, succeeding in driving the Mandalorian forces away from Republic space. During the war, Revan learned of Malachor V, a planet that the Mandalorians considered a "cultural taboo." The planet itself was a storehouse of ancient Sith knowledge, steeped in a darkness so great that it almost destroyed Revan. He was able to survive this darkness only through his enormous strength of will. Soon after, Revan discovered the Trayus Academy, where he was supposedly corrupted by the teachings of the Sith. In reality, what he discovered was the truth about a new terrible threat beyond the borders of the Galaxy, a force unknown to the Jedi and the Mandalorians: the hidden Sith Empire of the "True Sith." Malachor V and other Sith worlds in the Outer Rim Territories were edges of this ancient Empire. Indeed, this was the real danger behind the Mandalorian Wars that the Jedi Council felt. By weakening their future combatants (the Republic, the Jedi, and the Mandalorians) in this war, the "True Sith" hoped to defeat their wounded enemies. Revan realized that the only way the galaxy could stand against this enemy was under the control of a great military government, not directed by the Jedi but instead by someone who understood the Sith philosophies, someone who understood the true ways a war is fought, not with the crude matter of flesh and machines, "instead the true war is waged in the hearts of all living things, against our own natures, light or dark." With the help of a loyal army, he could abolish the corrupt Republic system, allowing a process of bolstering and militarization across the galaxy. And, as a back-up if he lost, and believing in the Sith principle of "empowerment through conflict," the Republic will still have gained enough strength to win over the hidden threat. Thus, Revan, a hero of the Republic and the most prominent Jedi Knight of his time, renamed himself Darth Revan, Dark Lord of the Sith (later, some such as Kreia would postulate that Revan did not fall to the dark side, but rather sacrificed himself into it in the hope of saving the Galaxy from the "True Sith"). In order to deal with the Sith menace, the Mandalorian Crusade had to be stopped swiftly and decisively. The final battle of the war took place over Malachor V. Revan sent his least loyal troops to lure the remnants of the Mandalorian fleet there, where the Mass Shadow Generator (a weapon of mass destruction capable of generating a "gravitic implosion shockwave") had been placed. The General overseeing its use was the Jedi later known as the "Jedi Exile." In battle that followed, many Jedi fell to the Dark Side because of the Dark Side energies that Malachor V emitted. Many more Jedi, Republic soldiers, and Mandalorians died when the Jedi Exile ordered to activate the Mass Shadow Generator, nearly destroying the planet. Few on either side survived. Meanwhile, Revan fought Mandalore the Ultimate (the Mandalorian leader) in single combat. Revan won, not only executing the Mandalorian in front of his followers, but also taking his helmet, and so denying the surviving Mandalorians their right to choose a new leader. The warrior spirit of the Mandalorians had been broken, and their Crusade was finally over. Although the Republic suffered catastrophic losses, Revan still commanded a third of the Republic forces; thus, the War served to create Revan's Army, a military force that considered both Revan and Malak their heroes. Also, every single Jedi who followed Revan into the War (with the exception of the Jedi Exile) had died or turned to the Dark Side at Malachor V, accepting Darth Revan's Sith teachings and forming a new Sith cult; most notably, Malak grudgingly assumed the role of Sith apprentice under the title of Darth Malak. While the Jedi Council denounced his right as a Jedi, the Republic hailed Revan as a savior. The new Dark Lord of the Sith prepared his forces for the conquest of the Galaxy. Ironically, it seemed that by trying to save the Republic, he had to invade it to prepare it for the oncoming threat. He was a savior, a conqueror, a hero, and a villain all at once. After his supposed corruption and the final battle of Malachor V, Revan took his forces beyond the known galaxy, claiming to be searching for the remnants of the Mandalorian fleet. In reality, he was in search of an ancient artifact, a megastructure known as the Star Forge, built by the Rakatan Infinite Empire nearly 30,000 years BBY. During his search for Sith knowledge on Malachor V, Revan learned about a massive space station with the ability to produce an almost limitless number of ships, accomplished by siphoning matter and energy from a nearby star, as well as feeding on the dark side energies imbued within it. With the help of the pieces of information stored inside the ancient Star Maps, Revan and Malak were able to discover the exact location of the long forgotten Star Forge. Revan and Malak, now beholden to the dark side, created a massive fleet to destroy the Old Republic and the Jedi Council, whom Revan thought were too pacifist to be of any use in the New Order of the Sith. He reformed and converted the loyal ex-Republic forces who followed them into a militaristic empire. One year after the end of the Mandalorian Wars, Darth Revan returned to Republic space at the head of a massive invasion fleet made up of Republic vessels and ships of Rakatan design, war-veterans, soldiers and officers, and thousands of Sith apprentices and Dark Jedi. 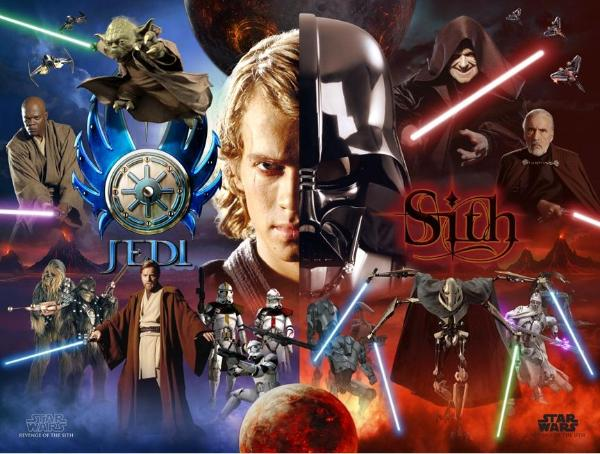 Calling themselves the Sith, they declared war on the Republic. The Sith won battle after battle, until a young Jedi named Bastila Shan entered the fray with her Battle Meditation. This rare and powerful Force ability increased the combat effectiveness of the Old Republic's forces and sapped the will of enemy combatants. Even with this power, the Old Republic's forces knew that they could not hold out forever against the Sith. In a desperate attempt to end the war, the Old Republic set a trap for Darth Revan and Darth Malak, during which Bastila and a team of Jedi boarded Revan's flagship and managed to corner the Dark Lord on the bridge. Before the Jedi could continue their plan, Darth Malak, likely knowing he could not defeat Revan in personal combat, took this opportunity to kill both Revan and Bastila with one swift stroke. He fired upon the flagship from a nearby battle cruiser but failed to kill either his master or Bastila. Revan, was deeply wounded but Bastila used the Force to preserve the remnant of life inside Revan, creating a Force bond between the two. His destroyed mind was programmed by the Jedi Council to hide the Dark Lord's old identity, while enabling the Jedi to use Revan's subconscious memories to locate the Star Forge and destroy it without posing a threat to the Republic. Revan was enlisted in the Old Republic army and placed under Bastila's command on the Old Republic warship Endar Spire. Since Revan's demise, Malak, thinking his master dead, had decided to base the New Sith completely on the Dark Side, something that Revan had tried to avoid. Malak then devoted all his forces to the hunt for Bastila. In orbit over the world of Taris, the Endar Spire was attacked by a Sith fleet. Revan awakes with his bunk mate Trask Ulgo helping him out. Together they escape and almost make it to the escape pods when Darth Bandon arrives and Trask sacrifices himself so Revan can escape. Bastila managed to escape to the planet's surface, followed soon after by Revan and fellow Republic soldier Carth Onasi. The Sith blockaded Taris, intent on capturing Bastila. They were unaware that the young female Jedi had already been taken prisoner by a swoop gang called the Black Vulkars, who intended to give her to the winner of an underground swoop racing tournament as a slave. Revan eventually succeeded in rescuing her when he infiltrated and won the tournament. As the group decided on how to escape Taris, Revan mentioned to Bastila about a few visions he has had, and Bastila knew that Revan's Force powers were beginning to reawaken. 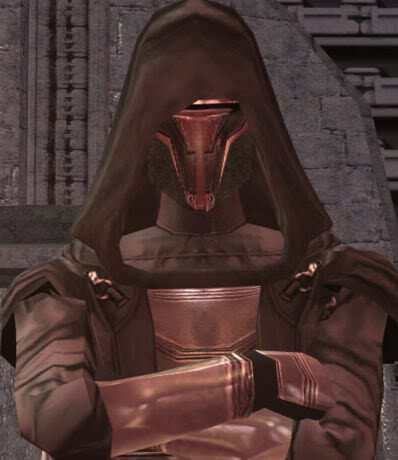 Because of his winning the race, Revan received a message from Canderous Ordo about an offer to escape the planet. Meeting up with the Mandalorian at the cantina, Ordo said that if they work together, he could provide the means to escape Taris, Davik Kang's flagship, the Ebon Hawk. First, Revan had to break into the Sith military base and steal the launch codes to bypass the quarantine. Revan used the help of a droid named T3-M4 (which he acquired by mentioning Ordo's name at the local droid shop). Using the droid's security hacking skills, he successfully acquired the bypass codes. Shortly afterwards, he infiltrated Davik's lair via Canderous' recommendation to join the Exchange, and he acquired the Ebon Hawk. However, in orbit, Darth Malak, deciding that the search for Bastila was taking too long, gave the order to destroy the entire planet. Positioning themselves in strategic formations, the ships of his fleet unleashed a devastating planetary bombardment that wiped out nearly all life on Taris's surface. Revan confronted Davik and Calo Nord, who both had the same idea of escaping and weren't about to let Revan take the Hawk. Revan killed Davik, and just as Nord decided to use a thermal detonator on the group, he was caught and trapped underneath falling hangar debris. Revan and his new found crew barely escaped in time aboard the Ebon Hawk. Revan and his companions fled to the Jedi enclave on Dantooine, where Bastila convinced the Jedi academy council to retrain the amnesiac Dark Lord in the ways of the Jedi. For his final task of training, Revan was to go alone to a grove tainted in the Dark Side, and remove the taint. The Council wouldn't explain more than this. After Revan reached the grove, he met a Cathar named Juhani, who was causing the taint, claiming to have fallen to the Dark Side (Juhani mistakenly believed she had killed her master in a training exercise). Revan bested Juhani in a fierce lightsaber duel and turned her back to the Light Side of the Force (or killed her if the player-character is dark-sided). After Revan completed his formal training, he and Bastila were sent to investigate an ancient stone structure. Inside, the two uncovered an ancient artifact known as a Star Map, a relic of the long-forgotten Infinite Empire of the Rakata. Though the Map was not complete, it pointed the way to the worlds of Tatooine, Kashyyyk, Manaan, and Korriban, on which more Star Maps could be found. Only with the combined information of these five worlds, Revan discovered, could the location of a mysterious Rakatan artifact called the "Star Forge" be found. Revan, Bastila, and their companions journeyed to these worlds, tracing the steps Darth Revan and Darth Malak had taken years before. On each planet, the powerful dark side aura of the Star Maps had created perilous conditions that made access to the Maps difficult. Additionally, the crew of the Ebon Hawk found themselves hunted by Sith and bounty hunters, and confronted with the problems of the local populace at every turn. After discovering the fourth Star Map (including the one found in the ruins on Dantooine), Revan and his allies were captured by the Sith flagship Leviathan. They managed to escape from their holding cells, but, as they fled toward the Ebon Hawk, Revan was confronted by Darth Malak, who revealed his former life as the Dark Lord of the Sith. A vicious lightsaber duel ensued, culminating with Bastila's capture by Malak. Revan was forced to deal with Malak's revelation and his loss of Bastila (with whom he had fallen in love, and her with him) as the quest for the Star Forge stepped up, until at last it was found in the home system of the ancient Rakata, on the home world known as Lehon. After gaining the support of one of two Rakata factions, Revan was forced to confront a fallen Bastila. She now claimed to be the Dark Lord's new apprentice. His original apprentice, a former Jedi named Darth Bandon, had previously been slain by Revan during the search for the Star Maps. Bastila lured Revan to the dark side with seduction. It was then Revan obtained his old memories as Dark lord of the Sith. He made the love of his life Bastila his new apprentice & set to the Star Forge. After what seemed like hours of fighting, they made their way to the Star Forge Command Center. It was here that Bastila used her Battle Meditation to aid the Sith in destroying the Republic by using her Battle Meditation. Reavn on the other hand, went to confront Malak. After a grueling battle, he successfully managed to defeat Malak. Revan then killed him. A year after the defeat of Malak, Revan left known space, having remembered the remnants of the ancient Sith Empire he had rediscovered as the Dark Lord, also known as the "True Sith." Hoping to put an end to the threat it posed before it could attack, Revan bade farewell to the nine comrades who had accompanied him on his quest, knowing that none whom he loved could safely accompany him in the places he had to walk. It is also believed by some that he sought exile after the Mandalorian and Jedi Civil Wars, thinking that because he brought the Sith upon the Republic, and then lost control of that power, that it was his own personal failure. "It would have helped," Darth Traya would later remark about Revan leaving Bastila behind, "had he made her understand. But she was always strong-willed, that one, and did not understand war as Revan did." Then Revan disappeared, leaving the Ebon Hawk with T3-M4 and HK-47 on Malachor V, on the edge of known Space. It has been shown in Star Wars Knights of the Old Republic II: The Sith Lords that T3 was programmed by Bastila to return to the Republic if something happened to Revan, and to contact Bastila if possible. T3 returned in the Ebon Hawk and found the Jedi Exile. What happened to Revan in order to activate T3's mission is unknown, although the navigational computer of the Ebon Hawk was locked by the time he found the Exile. It appears that after so many years in self-exile, Revan, the Star Forge, the True Sith & all the droids & Sith Interdictor ships, fighters, & troops were mysteriously warped to this time, which was 4000 years later in the future. Ever since, Revan took the title of Emperor of the True Sith & was slowly conquering the galaxy. However, only the Jedi masters & the New Sith Masters know he exists.